I’m not sure where to begin. This is the first novel I’ve read by Jon Cohen, and I can now say with great confidence that it won’t be the last. If there was a way to give this book 20 stars, I would. This is one of the most powerful novels I’ve read in a long time. It catapulted into my heart, and into my all-time Top 5. Harry’s Trees is about a darling character by the name of Harry Crane. Harry is a 34-year old analyst with the US Forest Service, and to say that he detests his job would be an understatement of monumental proportions. Harry is utterly devoted to his wife Beth, and when she suddenly dies (don’t worry – that’s not a spoiler), he finds himself completely without hope. Harry decides to leave his stifling desk job, and he finds himself traipsing a remote wooded area of the northeastern Endless Mountains in Pennsylvania. Unable to cope with the loss of his wife, Harry’s goal among these trees is none too pleasant. That’s when Oriana Jeffers appears. Oriana is a nine-year old girl with an astounding resolve, a brilliant imagination, and a tragedy of her very own. She and her mother Amanda have also lost a loved one – Oriana’s father, Dean. Dean was beloved not only by his family, but by the entire community, and his sudden departure has rocked his wife and his daughter to their cores. Oriana has her own process of grieving, and her road to emotional and spiritual recovery is suddenly intricately tied to this odd, and seemingly quite dull, government employee. Cue the precious and unlikely friendship between Harry Crane and Oriana Jeffers. And Olive, the town librarian. And Ronnie, Dean’s co-worker, and loyal friend. And Amanda, who’s hacking her own way through unbearable sorrow. And the Grum, from The Grum’s Ledger. You read that last sentence correctly – the Grum. Harry’s Trees will sweep you away. It will steal your heart with its reverence for nature, its faith in the healing power of love, and the very real magic that leads people to become the very best versions of themselves. I’m not exaggerating when I say that this book made me laugh, made me well up, and made my heart swell with hope. Every character in the book is beautifully complex, and each one is painted with very fine strokes. With Harry’s Trees, Jon Cohen created a setting that readers can relate to, and a story that readers can identify with. Loss, love, forgiveness, sincerity, trust, and just the right amount of wink from the other side make this novel a treasure. I know, I know. I’m a bit emotional over this one. But every once in awhile, you’re lucky enough to discover a novel that has the power to change your outlook, and give your faith in humanity a much-needed boost. 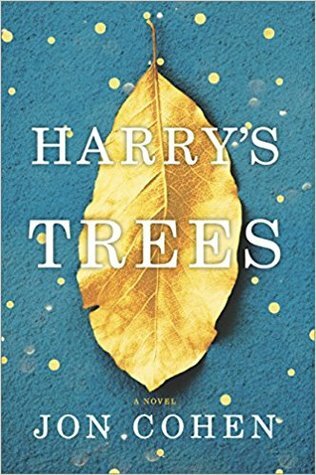 For me, Harry’s Trees was that novel. I already miss these people. I will read this again one day, and until that time, it will rest on my “favorites” shelf. You know that shelf – the one with the books that you smile at when you walk by and see their spines. The books that will never leave your collection. That’s Harry’s Trees. I am halfway through this book and am so very much enjoying. Thanks for the recommend. I used to live in the area of Pennsylvania where this takes place and I think it is one of the most beautiful places in our country. I have just finished The Overstory (thank you again) and have a newfound serious appreciation for trees. I have 2 maple trees that I love – now even more. I’m so happy you’re enjoying it! It does make us look at trees differently. They seem like such a refuge now. Thank you for visiting our site, Eve! This does sound just wonderful. In terms of the writing, did his style make you think of any other authors in particular? It really is wonderful. Without giving away too many plot points, I believe that the author’s style is his own.